The men’s team dropped a game on Friday against Harvard University 4-1. The loss dropped the Big Green to 9-12-2 overall and 7-8-1 in the Eastern College Athletic Conference. Harvard struck first, with the lone goal in the first period, only 3:58 into the game. However, Shane Sellar ’20 was able to equalize in the second period, assisted by Quin Foreman ’21 and Will Graber ’20, making it Sellar’s sixth goal of the year. Less than four minutes later, Harvard scored and never looked back. In the third period, Harvard added on to its lead with another goal and ended with an empty-net goal. The men will play two games away this weekend against Rensselaer Polytechnic Institute and Union College. The women’s team hosted two top-five teams this weekend and did not fare much better. Against the No. 4 ranked Colgate University the women fell 5-1. Despite the Big Green scoring six minutes into the first period, the Raiders responded with three goals within the first period and two more in the third period. The following day, the women played No. 5 Cornell and lost 3-1. Cornell’s defense proved to be too much as the Big Green remained scoreless until the middle of the third period when Tess Bracken ’19, assisted by captain Hailey Noronha ’18, found the back of the net. Unfortunately, it was too little, too late and the Big Green was unable to use the late momentum. The women currently sit at 5-17-1 overall and 3-14-1 in the ECAC. They will look to get back on track against RPI and Union this weekend. Despite battling fiercely through 40 minutes of regulation twice, men’s basketball team faced back-to-back losses on the road this past weekend against Cornell University and Columbia University. During Friday night’s game against Cornell, co-captain Miles Wright ’18 became the 29th player in program history to score over 1,000 career points. The accomplishment, however, was spoiled by the 86-85 loss. Cornell opened up a nine-point lead over the Big Green late in the first half, but two layups by Taylor Johnson ’18, who led the team in scoring with 25 points, shortened the Big Red’s lead to four going into halftime. In the second half, Cornell roared out of the gate and quickly extended its lead to 10. Buckets by Will Emery ’20 and Johnson helped the Big Green shorten the Cornell lead, then two jumpers by Ian Sistare ’20 helped Dartmouth take the lead. Dartmouth traded points with Cornell throughout the rest of the game, with the Big Green holding a narrow lead heading into the final minute of the game. After a late game foul by Wright sent Joel Davis to the charity stripe, Cornell took the lead for good with 25 seconds to spare. Johnson’s final jumper with four seconds to spare bounced off the rim, ending the Big Green’s hopes. Columbia controlled play on Saturday, holding the lead for most of the night. Adrease Jackson ’21 led the Big Green with 24 points and 14 rebounds, earning his first career double-double. Despite Jackson and Johnson’s combined 20 first-half points, the Lions could not be stopped as they headed into halftime with a 12-point advantage. Jackson and Wright attempted to make a comeback early in the second half each scoring 17 and 13 points in the period, respectively, to bring the game within one with 42 seconds to play. A late foul sent Columbia’s Kyle Castlin to the line where he sank both free throws. Dartmouth attempted one last shot but Brendan Berry ’20 had a three-pointer blocked as time expired. With the two losses to Cornell and Columbia, the team drops to 4-15 and 0-6 in the Ivy League. The Big Green will host the University of Pennsylvania and Princeton University this Friday and Saturday, respectively. Women’s basketball swept the weekend with back-to-back wins against Cornell and Columbia. The two wins move Dartmouth to 12-7 overall and 4-2 in the Ivy League, maintaining its fourth place standing in the conference. The Big Green women started the weekend with a 55-40 victory over Cornell with strong efforts from co-captain Andi Norman ’18 and Kate Letkewicz ’18 who led the team with 18 and 11 points, respectively. Cornell was down two at the end of the first quarter before Dartmouth put an 11-point lead between it and the Big Red heading into the second half. The Big Green maintained a comfortable double-digit lead for most of the third quarter and all of the fourth quarter, en route to the 15-point victory. Dartmouth finished the weekend with an 88-65 win over Columbia. Letkewicz led the Big Green in scoring with 20 points on the night. She added 10 boards to secure the double-double. Cy Lippold ’19 put up 15 points and 12 assists to propel Dartmouth to its second straight win with a double-double of her own. After the Big Green accumulated an 11-point halftime lead, Columbia attempted to bounce back at the beginning of the third quarter, bringing the score within three points. Following Columbia’s run, Dartmouth stepped up its play, eventually leading by as much as 27 points in the fourth quarter. The Big Green shot 57.6 percent from the field. The Big Green go on the road next week to compete against the Penn and Princeton. Men’s squash lost to No. 6 University of Pennsylvania 5-4 and beat No. 7 Princeton University 5-4 this past weekend. Despite winning the first three matches against Penn, the Big Green won only four out of the final six matches. Reg Anderson ’20, Sam Epley ’19, Matt Giegerich ’19 and Carson Spahr ’19 all came out with victories. After Saturday’s loss, Sunday’s matchup with Princeton became ever more important. The back of the Big Green’s lineup dominated with Brandon de Otaduy Nam ’20 winning at the No. 5 slot and the Big Green sweeping the bottom three positions. Jack Harvey ’18 clinched the match for the Big Green after a huge 11-3, 11-8, 11-8 victory. Women’s squash fell to No. 7 Penn on Saturday and No. 1 Princeton this weekend. The Big Green has now lost seven consecutive matches, all against top - 10 teams. The team struggled against Penn, with the top six courts losing in straight set battles. The bottom of the lineup fared much better for the Big Green, where Ellie Gozigian ’21, Zainab Molani ’18 and Emma Roberts ’19 all claimed wins to end the match 6-3. On Sunday, the Big Green was unable to get much going against Princeton, losing 9-0. Becky Brownell ’18 fought in arguably the closest match of the afternoon, falling 12-10, 11-13, 11-6, 11-8. Men’s and women’s squash travel to Providence, Rhode Island to face Brown University on Friday, before returning to Hanover to host Yale University on Sunday. The ski team had yet another victory at the University of Vermont Winter Carnival, winning for the third year with a total of 969 points, 37 points over host UVM. On Friday, Katharine Ogden ’21 started the day off strong for the Big Green finishing second in the women’s 15-kilometer freestyle with a time of 46.29 seconds with teammates Taryn Hunt-Smith ’19 and Abby Drach ’20 finishing in fourth (47:23) and fifth (47:25) respectively. In the women’s giant slalom, Foreste Peterson ’18 and Claire Thomas ’21 finished in second and third place with times of 2:10.01 and 2:10.14, respectively. The men had a strong showing with Luke Brown ’18, Callan DeLine ’18 and Gavin McEwen ’19 finishing third (53:37.8), fourth (53:48.9) and fifth (53:49.6), respectively, in the men’s 20-kilometer freestyle. Going into Saturday, the Big Green was leading UVM by seven points. Peterson finished second in a time of 1:51.05 in the women’s slalom, with Alexa Dlouhy ’19 finishing third. In the women’s 5K Classic, Dartmouth placed three out of the top four. Ogden, who narrowly missed out on first place by three tenths of a second, Drach and Hunt-Smith helped the Big Green claim a team victory in the event. On the men’s side, Tanguy Nef ’20 and Brian McLaughlin ’18, finished in first and fourth place respectively, with Nef winning the event by two seconds. In the men’s 10K Classic, Brown and Deline came in fourth and fifth, respectively, finishing a tenth of a second within the other. This win is important momentum going into Winter Carnival this weekend when Dartmouth hosts competition in the East. The men’s and women’s swimming and diving team traveled to the Big Apple this weekend where it competed against Columbia University in its last dual meet of the season. Both teams lost to the Lions, with the men finishing 162-134 and the women falling 61 points behind Columbia with a score of 114. Allison Green ’19 took second in the 3-meter dive with a final score of 278.41, starting the meet for the women. Dartmouth’s first individual win was earned by Hayley Winter ’18 when she touched 21 seconds ahead of Columbia’s Clare MacNamara in the 1,000-yard freestyle. The co-captain continued her strong swimming throughout the day with a second first-place win in the 500-yard free. Green and Mackenzie Stumpf ’21 added two more first place wins of the day as they competed in the 1-meter diving and 200-yard individual medley respectively. After Columbia senior Nicole Papsco narrowly edged out Stumpf by three-tenths of a second in the 100-yard breaststroke, the first-year bounced back to lead the pack of Big Green competitors Molly Brickman ’19, Kenna Van Steyn ’21 and Melanie Zaraska ’19 in the 200-yard IM as they took the top four places each finishing within five seconds of each other. The Big Green finished the day strong in its final event — the 200-yard freestyle relay. Dartmouth A, made up of Alie Hunter ’21, Cathleen Li ’21, Summer Martin ’21 and Sophie Smith ’20, finished in first with a time of 1:37.1. The Dartmouth B and C teams finished second (1:39.16) and third (1:43.56), respectively. As with the women, the men’s team earned four of its six first-place wins in the freestyle events. Co-captain Tony Shen ’18 earned the first Big Green win of the day in the 200-yard freestyle after a close race when he touched two one-hundredths of a second ahead of Columbia freshman Adam Osowski. Shen also bookended Big Green event wins, serving as the anchor leg of the Dartmouth A team, comprised of Carter Jacobsen ’19, Brandon Liao ’21 and Henry Patrick ’19 in the 200-yard freestyle relay. The Big Green led the pack with the B and C teams finishing next within two seconds of each other. Connor LaMastra ’21 also added three wins to the Big Green’s total by finishing nearly six seconds ahead of Columbia’s Alexander Walker in the 200-yard butterfly with a time of 1:48.67 and winning both the 500-yard freestyle and the 200-yard IM. Men’s tennis swept the weekend against Indiana University and the University of Louisville, improving to 6-0 this season. The team edged out a narrow 4-3 victory over the Hoosiers on Friday. In doubles, Charlie Broom ’20 and David Horneffer ’20 started strong with a 6-4 victory against Indiana’s Raheel Manji and Keivon Tabrizi. Although the Big Green lost at No. 3 doubles, Roko Glasnovic ’19 and Casey Ross ’21 secured a tight victory at No. 2 to give Dartmouth the doubles point. The singles matches were highlighted by Broom’s victory over defeating No.125 Manji in two swift sets and Dan Martin ’21’s win over Antonio Cembellin at the No. 2 spot. The Big Green had an easier day on Sunday when it met Louisville. The doubles point was quickly earned by the Big Green after wins by Broom and Horneffer at the No.1 spot and Max Fliegner ’18 and Peter Conklin ’21 at the No. 3 spot. Dartmouth increased its lead as Ciro Riccardi ’18 beat the Cardinals’ Ciro Lampasas in two 6-1 sets. The Big Green finalized the win when Fliegner won at the No. 4 spot 6-4, 6-4. The Cardinals’ only point came at No. 6 singles. The men return home this week to host the University of Minnesota, Rice University and Bryant University. Women’s tennis hosted Boston College and William and Mary College this weekend, losing to both teams. Against Boston College on Friday night, the Big Green battled to a 5-2 loss. The Eagles began the scoring with victories at the No. 1 and No. 3 doubles spot to give them the doubles point. After two quick victories by the away team in singles, the score stood at 3-0 in favor of BC. In an attempt to recover, Allison McCann ’20 and Julia Schroeder ’18 won their singles matches in straight sets. The Eagles clinched the match, however, after No. 78 Kristina Mathis ’18 lost to Asiya Dair 7-5, 7-6 (9-7) with Boston College pulling ahead in a second set tiebreaker 9-7. William and Mary dominated Sunday afternoon, beating the Big Green 6-1. Schroeder had the best outing for the Big Green, winning both her singles and doubles matches. Partnered with Abigail Chiu ’21, Schroeder easily took down Ekaterina Stepanova and Olivia Thaler 6-1. In singles, Schroeder’s victory over Clara Tanielian gave Dartmouth their only point of the day. Mathis fell in a third set super tiebreaker to Rosie Cheng at the No. 1 position. The team falls to 3-3 with the two losses this weekend. The Big Green will be on the road this weekend, heading down to Princeton, New Jersey for the Eastern College Athletic Conference Indoor Championship. The women’s track and field team had a little more luck than its male cohort at the New England Championship, finishing in second with 89.5 points to the men’s seventh-place finish with 25.33 points. Facing a tough field of competitors, Amos Cariati ’18 scored the first points for the men’s team after he finished fifth in the 400-meter dash, one second behind first-place finisher Northeastern University freshman Quinn Litherland. The Huskies got the best of the Big Green again as David Adams narrowly edged Tim Zepf ’21 out of first by two one-hundredths of a second during the 500-meter dash. Alec Eschholz ’19 added a few more points to the Big Green’s scoreboard when he took fifth with his 8.21-second time in the 60-meter hurdles. Corbin Mayes ’21 successfully cleared a 4.7-meter vault good for a three-way tie for eighth place with Central Connecticut State University’s Sam Borecki and University of Connecticut’s Chandler Ives. The women’s team started scoring early in the day as Nicole DeBlasio ’19 took seventh for her 7.82-second 60-meter dash. Immediately after, Cha’Mia Rothwell ’20 scored her first win in the 200-meter dash, finishing in 24.2 seconds. Despite improving her time from the preliminary rounds, Rothwell came in second in the 60-meter hurdles behind Quinnipiac University’s Jessica Lee, who broke the meet record with her time. 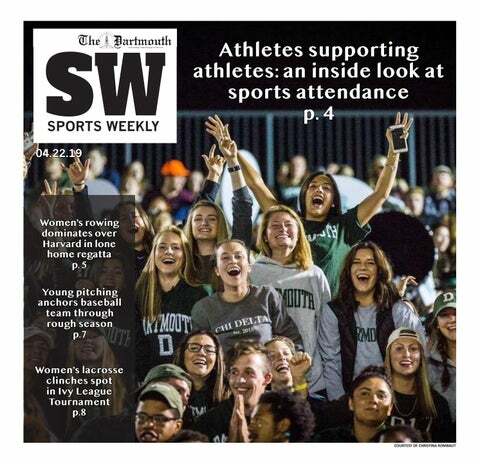 As the day progressed, Dartmouth took home several other titles including the 4x800-meter relay (9:03.77) as Annalisa Crowe ’20, Anna DiMarcello ’21, Isabelle Giordano ’21 and Alexa Jennings ’19 finished five seconds ahead of the Bobcats. Maria Garman ’19 set the tone for the field events as her 1.74-meter high jump put her in a tie for first place with Quinnipiac’s winning Cary Timpson. Julia Valenti ’20 continued the strong showing, winning the pole vault while Rothwell finished the day with a second-place finish in the long jump.